Sometime at Mobile Bingo Bonuses we hate having to choose between bingo and mobile slots but now you can enjoy both in one great game, Bingo Billions slots combine our two great loves and now that its available on mobile you can play it anywhere you like. Bingo Billions slots is the latest in a long line of successful incarnations from NextGen, the Australian based game designer behind some of the most popular mobile slots available, as you can probably guess Bingo Billions carries a them which will be instantly recognisable to bingo players. With state of the art graphics to perfectly showcase the bingo balls, wads of cash and gold bullion symbols which make up the game board. Just like most popular slots, Bingo Billions works on five reel, twenty five line platform with stakes ranging 0.25 to 50.00 per spin so you can be as adventurous or as cautious as you like, there is also the option to autoplay to make your gaming even easier and allow you to carry on with your day. Bingo Billions wouldn’t be a typically great slot game without the inclusion of bonus spins and various bonus rounds for your entertainment, which can also dramatically increase your winnings. You can find the standard bonus symbols in Bingo Billions mobile slot, which are the wild, scatter and bonus spin symbol. 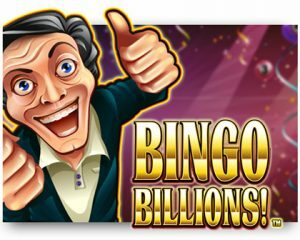 With a standard wild symbol that can replace everything but the scatter symbol, turning the most uninspiring spin in to a lucrative win line, the scatter and spin bonus symbols are both identified by the Bingo Billions logo. Spin in two, three, four or five scatter symbols to receive a 2x, 4x, 15x or 100x scatter prize respectively, with three or more symbols launching the games. 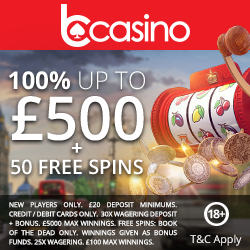 The number of bonus spins given out will also depend on the number of symbols you land but are dished out as ten, fifteen or twenty spins, during the bonus spins feature, all prizes are tripled and it is possible to retrigger additional spins too, which makes this a lucrative bonus feature. As huge fans of both bingo and slots we really liked the premise of Bingo Billions and although this game doesn’t carry the quirky and dynamic symbols or feature video rounds of other games, we found Bingo Billions extremely playable mobile slot and with an impressive payout rate of just over 95%, you get plenty of chances to call house and cash in. 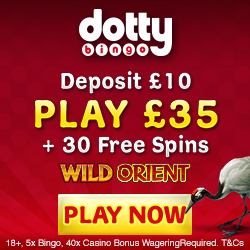 To play Bingo Billions Slots simply head over to Dazzle Casino.